The way Chocolate Doom works is running the game in the user native monitor resolution but rendering the world in the original Doom resolution of 300x200, filtered or unfiltered and running the shadowing and lights in an emulated 256 colors mode respecting the original look of the game. Of course forced to 4:3. I consider it could be interesting as an option run Daggerfall in a "freak" retro fundamentalist mode. Gudadantza wrote: The way Chocolate Doom works is running the game in the user native monitor resolution but rendering the world in the original Doom resolution of 300x200, filtered or unfiltered and running the shadowing and lights in an emulated 256 colors mode respecting the original look of the game. Of course forced to 4:3. This is more or less how Daggerfall Unity works. I don't emulate a true 256-colour palette for lighting, etc. but the original palettes are used everywhere. Keep in mind Daggerfall Unity is not a source port like Chocolate Doom, it's a complete ground-up rewrite with its own goals, so my engineering choices will be different in many ways. First make a backup of your settings.ini then overwrite settings with the below. Make sure to copy in your correct game path from old settings before saving. This is about as close to retro as I can make the experience. It's not perfectly classic, but I think you'll be in for a pleasant surprise. Edit: You'll need to use these settings with latest builds, and they won't work from inside Unity editor Play mode. Has to be played from a build. Edit2: After restoring your backup settings, you should step through the setup again (hit "restart" top-left) and configure resolution again to make sure everything is put back to normal. For anyone after a slightly crisper retro experience, set the resolution to 640x400 or 800x600 for a really nice SVGA 90s look. I`ll try that settings. Greetings. I always had it in my head the game should continue to work at 320x200 and stay true to those roots. I'm really happy with how far Daggerfall Unity has come forwards with mods, but I'm also happy it can go backwards a bit as well. Yeah, debug overlays run at a higher resolution so I could fit more on the screen. Anything gameplay related should be ok though. Let me know if you hit any other problems. Had to give it try for the sake of the olden days. I can certainly understand that some people (or maybe even a lot of people) might enjoy the "vanilla look". But... is it just me, or is it outright blurry in comparison with the original? Also the renderer obviously behaves differently (no surprise there), I have noticed it on moving NPCs in towns. When watching them from a distance, DFU seems to "artifact" in a much noticeable way. As if the original renderer works exactly the opposite way than expected (sampling all_the_pixels_of_a_texture-flat to the limited screen resolution instead of using one sample per screen pixel). Also, the lighting (dungeons) is very much different in DFU (although, I do hope it will get fine-tuned later for a more scary atmosphere). All that said, I am sure I will prefer the new crisp look of DFU. All the stylised textures finaly can show their good looks from a distance. 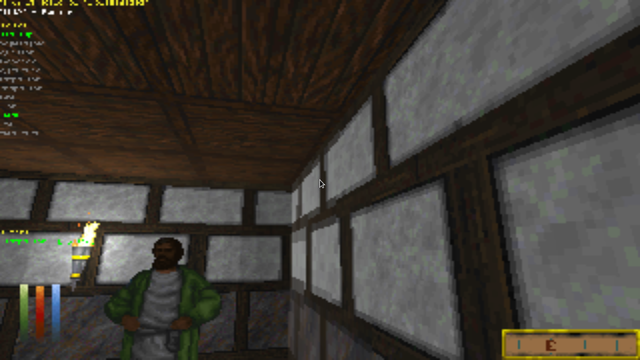 Honestly the high resolution modes in Daggerfall Unity work amazing in a game like this and the low res assets of the original resize very good in the new renderer. Even the lighting is superior, but the vanilla has some kind of charming due to the technical limitations (?). Vanilla has some kind of vibration in the rendering/textures (hard to explain) different to other games of the era and the 256 colors light and dungeons result in a very creepy atmosphere. Maybe the rare mouse sensibility or the head movement help in the feeling.